London South Bank University (LSBU) School of Engineering students are on track to take part in the world’s biggest student motorsport competition, held at Silverstone from 14-17 July. The global Formula Student competition, run by the Institution of Mechanical Engineers, is the world’s largest student motorsport event and challenges student engineers to design, build and race a single seat racing car in one year. Applications were received from many teams around the world, with 156 teams – including LSBU – successfully claiming a place to take part in the competition. The students will design and build a car to be judged on its speed, acceleration, handling and endurance, in a series of time-trial races. The teams are also tested on their design, costing and business presentation skills. Dozens of Formula Student alumni have progressed into careers in Formula 1 and hundreds more are now working at the world’s largest automotive firms helping to design and engineer the cars of tomorrow. LSBU's students will attend an opening ceremony for the competition and meet with Ross Brawn, Competition Patron and former Team Principal of the Mercedes AMG Petronas Formula One Team. Other competition ambassadors this year include Paddy Lowe, Executive Director of Mercedes AMG Petronas F1, Willem Toet, Former Head of Aerodynamics at Sauber F1, former Formula 1 driver David Brabham and BBC science presenter Dallas Campbell. LSBU's team will compete with both domestic and international students from 34 countries in Europe, Asia and Australia. Richard Folkson, President of the Institution of Mechanical Engineers, said: “Students who compete in Formula Student are highly valued in all sectors of industry, not just in automotive engineering, but across all disciplines such as aerospace, power industries, manufacturing and process industries." The benefits of the competition are in teaching teamwork, delivering challenging technical targets on time and within a tight budget and pushing the boundaries of what is technically possible, while showing the judges they understand the science behind their ideas. The Formula Student team at LSBU are also collaborating with other universities participating in the competition. Students recently visited their counterparts at University College London (UCL), giving a presentation on the current status of their car's design and manufacture, ahead of visiting the UCL team's workshop and learning more about their previously entered Formula Student cars. 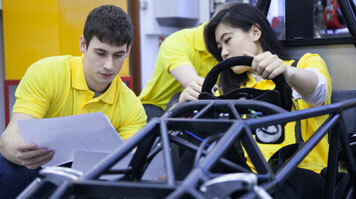 Find out more about studying Vehicle Engineering at LSBU.